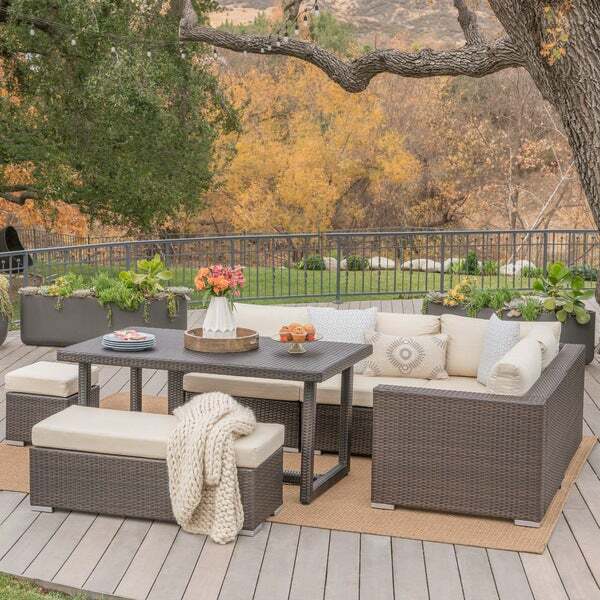 Everything you need and more for enjoying your patio, backyard, or garden. This versatile, outdoor dining sofa set allows you to entertain or dine in style and ultimate comfort. Made from the highest quality rattan and waterproof fabric, this set is designed to hold up over the years and still look great. We were able to put it together easily- be sure you read directions &amp; sort the screws before assembling. I like it on our patio. Wish it would have three seats in both directions...it’s a little cramped on the side with two seats. I am going to Velcro the cushions down bc they slide on the furniture. I’m also going to buy a cover for it. Good quality &amp; seems sturdy. I think we’ll enjoy it for a long time. My Santa Rosa wicker dining set exceeded all my expectations. The quality is excellent and the colors indicated on the site was just as shown. There are several arrangement possibilities. I now have it set up for mainly conversation and have pulled the table and bench away to allow for more room. When entertaining I will simply move the table back in and will have amply seating. nice, clean design. the cushion fabric could be a little better quality for the price, but we were ready for a pollen free new outdoor set that could be used for lounging AND dining. great looking and functional. Great quality for a good price! Easy to install the sofa and table. The table is a bit large when compared to the sofa but you could easily add additional pieces to extend the sofa length. Would highly recommend for your outdoor patio! Exactly as pictured, good quality. Hired someone on Takl who put it together in less than an hour so...easy assembly? Love that the table is the right height for dining while you’re super comfy on the sofa. I love this set. Comfortable and versatile configuration. I have a small deck and have it set up differently than in the picture. Great set. It was very helpful that I could change the configuration of the set to fit the small porch space. Great set for the price. Easy to assemble. 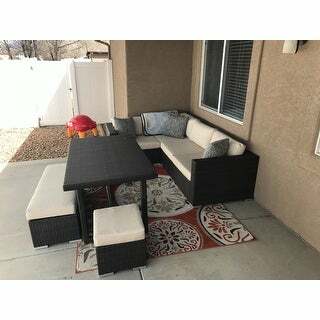 Few flaws, cushions do not have anything to tie down to prevent them from blowing off the benches and the table retains a ton of water when it rains due to how it’s built. Overall great look, comfort and functionality. Very nice set. It did take a few hours to assemble but was pretty easy to do.feels sturdy for its intended use. Cushions are firm. The grey is a nice variation. Very comfortable and nice quality. For the size, this was fairly easy to put together (w/2 people). So far so good, seems sturdy and well-built. Was a good value for the price! "What is the length of the small portion of the "L" shaped couch?" Since this set can be arranged at your preference, only the individual dimensions are available which are listed on-site. "Would cats easily ruin this?" "Where can you get extra couch cushions for this set?" We do not sell cushions separately at this time. "What is the best furniture cover to go with this set?" "How many can sit at the table for dining purposes?" "Is the "wicker" natural material or man-made resin material woven to look like wicker?" "Please send picture of the gray and silver cushions Thank u. " Please see picture in sheet 2 on the product page. I hope it helps.